The Chicago Blitz were off to a lesser start than anticipated in the inaugural United States Football League season as they hosted the Los Angeles Express on March 27, 1983. Coming into the new league with the best-known head coach, George Allen, and a veteran-laden roster that also included touted rookies in HB Tim Spencer and WR Trumaine Johnson, the Blitz were viewed as the team to beat. But after handily defeating Washington in the opening week, they dropped two straight contests and were at 1-2 as they faced Los Angeles. The Express was coached by Hugh Campbell, who had enjoyed success in the CFL. He employed a two-quarterback rotation that utilized veteran NFL backup Mike Rae and rookie Tom Ramsey out of UCLA, and unheralded rookie RB Tony Boddie had been a pleasant surprise. The defensive line, anchored by NT Eddie “Meat Cleaver” Weaver was an asset. It was a chilly, rainy day at Soldier Field before a sparse crowd of 10,936 fans. Following a scoreless first quarter, John Roveto kicked a 38-yard field goal with 5:43 remaining in the first half to put the Blitz in front by 3-0. Meanwhile, Tom Ramsey came in at quarterback for an ineffective Mike Rae early in the second quarter for the Express. Later in the period, the Blitz put together a 64-yard series that included an uncharacteristic gamble. Facing a fourth-and-three situation, FB Kevin Long ran around left end for an 11-yard gain. 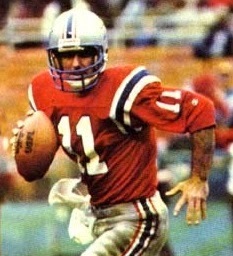 QB Greg Landry (pictured above) then threw to Trumaine Johnson for 22 yards and Long finished the drive off with a one-yard touchdown carry. Roveto added the extra point and Chicago took a 10-0 lead into halftime. Early in the third quarter, a breakdown by the Blitz defense allowed Ramsey to throw to Tony Boddie for a 40-yard TD and Vince Abbott kicked the PAT. With the lead cut to three points, the Blitz drove 73 yards in 10 plays. Landry completed passes to TE Paul Ricker, Trumaine Johnson, and WR Wamon Buggs along the way and capped the possession by floating a pass to TE Doug Cozen that was caught just inside the end zone for a five-yard touchdown. A pass interference call on the visitors was declined, Roveto kicked the point after, and it was a 17-7 game. LA got a break later in the period when a poor punt by Chicago’s Frank Garcia traveled just 18 yards. The Express capitalized, scoring on a touchdown pass from Ramsey to TE Ricky Ellis that covered 18 yards. The extra point by Abbott again narrowed the margin to three points. For the remainder of the contest, the Chicago defense came up with key turnovers to expand and then preserve the lead. First, MLB Jim Fahnhorst recovered a fumble by Los Angeles FB LaRue Harrington, who was stripped by DT Joe Ehrmann, and that led to a 24-yard Roveto field goal that put the Blitz up by six points with 2:07 remaining. There were still opportunities for the Express, but Chicago’s defense garnered two more takeaways in the last two minutes to seal the win. LB Ed Smith and safety Eddie Brown intercepted Ramsey passes and the Blitz won by a final score of 20-14. Chicago had the edge in total yards (322 to 208), with an almost-equal balance between rushing (158) and passing (164), and also led in first downs (19 to 12). Los Angeles turned the ball over three times, to none by the Blitz. However, Chicago was hurt by 13 penalties, to just five called on the Express. Greg Landry completed 20 of 36 passes for 173 yards with one touchdown and no interceptions. Tim Spencer ran for 87 yards on 21 carries and Kevin Long added 58 yards on 12 attempts that included a TD. Trumaine Johnson topped Chicago’s receivers with 6 catches for 70 yards and Wamon Buggs contributed another 53 yards on his three receptions. For the Express, Mike Rae was a dismal four-of-12 for 29 yards before being relieved by Tom Ramsey, who was successful on 8 of 20 throws for 93 yards and two TDs, but also gave up the two late interceptions. Tony Boddie rushed for 50 yards on 10 carries and also topped the club with 46 yards on his two catches that included a score. WR Kris Haines, RB Wilbert Haslip, and LaRue Harrington all had three pass receptions, for 26, 20, and 12 yards, respectively. The Blitz went on to a 12-6 record, finishing second in the Central Division and grabbing a Wild Card playoff spot. While leading the USFL in scoring and overall defense, Chicago was not so adept at holding fourth quarter leads over the course of the season as it was against the Express, and that extended into the playoffs as they fell to the Philadelphia Stars in the Semifinal round. The inconsistent Express ended up at 8-10 and second in the weak Pacific Division.